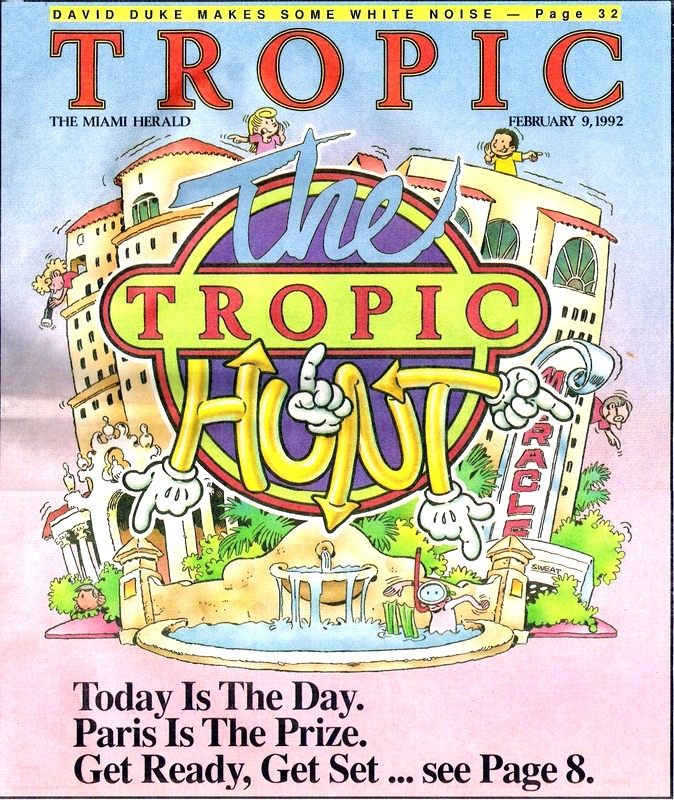 Your online guide to the zaniness of the 1992 Tropic Hunt! \nThis was also the first time I was able to catch up to Dave and have my photo taken with him (see the autographed picture below)! NOTE: The puzzle answers are hidden! In order to see them, you must highlight them with your mouse to reverse the text! No initial puzzles available for this year. NOTE: Puzzle answers and their descriptions are hidden! In order to see them, you must highlight them with your mouse to reverse the text! A fourth berth was empty. The lost bus must be found to finish the equation. Luckily next to the berths were signs describing the routes of all the buses. Follow the route until the lost bus was found (six blocks away.) Its route sign read (Route 4) 16. The sunbathing beauty is holding a copy of the Tropic magazine section, and if one looks carefully one sees the log for the personals column in Tropic Magazine. Looking at the clouds --- 38 can be seen. But that is not a number in the list of clues. Going to the classified ads and look for a further clue there. One ad is "HOT NUMBER" which is just what you're looking for. The end of that add reads "I am a dreamer, the type who sees things in the clouds. But sometimes visions aren't enough. That's why I am desperately seeking my double." In Tropic Magazine that morning in the Tropical Wildlife fashion section was a picture of man wearing a colorful outfit with a big question mark on his back. When six people wearing similar outfits were seen at sites around town the participants should have taken notice. However, instead of a question mark, the shirts had F6, L+, R5, E2, I?, and E2. Re-arrange the shirts to spell RELIEF (R5 E2 L+ I? E2 F6). Take away the letters and get 52+?26. But what does "?" stand for? Back to another Q&A in the article! Q: "What does South Florida need that your hometown (Orlando) has? A: "Another major east-west highway, Interstate 4, I-4." Puzzle: Dave Barry for President! On one side of a slip of paper handed out at the rotunda of the Colonnade Hotel read "The Hunt Movie Admit One". Go the the Miracle Theater (pictured on the Hunt map) and watch a six minute campaign movie. The film's title was "Dave Barry For President. The Price Is Right." Throughout the movie nefarious sharacters are handing Dave money. The money adds up to 950 dollars. When the film was over, it was "suggested" to the audience that they watch the credits. The second to last credit read "Final Answer - Divide Total By Two"
At the Hunt music festival, three different music groups were playing simultaneously on three small stages. At each site there was a sign that read "Hunt Musical Productions Presents: WHAT'S WRONG IS RIGHT, A Concert To Right The Wrongs of the World" and a sign with a number on it. Notice that the quartet had only three players. Put the numbers in the order that the racers finished. 59. Police allege that on the night of Dec. 21, 1991, Arnold M. "Eight Ball" Heemer did allegedly assault Raymond F. "The Moth" Quaverman with an alleged manatee organ. 78. It was a couple of months back on Christmas, and I was, like, going bananas because the pet store was closed and I just had to have a gerbil, if you know what I mean. 108. When you're at an outdoor cafe in Monaco on a sunny Friday in June drinking frozen cocktails with little red umbrellas and chatting with beautiful members of the international set, the last thing that you want to worry about is Protruding Nasal Hair. 475. This is one of your initial clues. It will help you in the end. 519. The three-credit course, Godzilla's Knee vs The History of Economics, meets Thursdays from 7 p.m. to 10 p.m. Bring a sleeping bag. NOTE: The final puzzle description is hidden! In order to see them, you must highlight them with your mouse to reverse the text! The final clue broadcast on the radio was Paul Anka singing the chorus of "Lonely Boy". 1) The clue contained a day of the week in it, or a way to determine a day of the week. 2) There was a reference to objects on the Hunt Map. The clues had to be arranged in order, by day of the week. Then the map coordinates for each of the objects mentioned in the five clues were written down. P-A S-S W-O R-D I-S B-O O-G E-R = Password is BOOGER. The final clue "This is one of your initial clues. It will help you in the end" was needed to decode the Final Radio Clue. "Lonely Boy" was the heading of of another personal ad in the Tropic Magazine. "Blue, unloved, sentimental -- the eternally romantic, male is now awaiting love. Be unfailingly mine." From the leftover clue it must be surmised that the INITIAL letter must be taken trom each word ot the ad to find the path to the final solution. It reads "Bus Terminal Bum." All that had to be done to win was to find the bum In the hallway of the bus terminal and whisper "booger" in his ear. Wayne, Maria, Marisa, and Lisa Berenbaum. CLICK HERE TO BROWSE PHOTOS FOR 1992! Photo - Dave Barry & Tropic Hunt Archives Curator Andy Wenzel! URL - VIDEO - "Hunting With The Streit Brothers: A Home Documentary of the 1992 Tropic Hunt "